Caffeine is to reach for when we need to stay awake or need to be focused and alert. Because of excessive consumption, regular caffeine in coffee may no longer enough. But don’t worry because there are coffees available out there, which contains more caffeine than our regular coffee. They are Death Wish and Valhalla Coffee, go ahead and read our article below to know more about them. Death Wish is a brand of coffee that is claimed to be the “World’s Strongest” coffee available. Death Wish gains more popularity after appearing in 30-second commercial during the 2015 Super Bowl after winning the Intuit’s “Small Business, Big Game”. Actually Death Wish has been around years before since 2012 and is based in Round Lake, New York. Aside from the original coffee, Death Wish also offer other variants, such as the Valhalla Java Odinforce, Cauldron Aged Pumpkin, and Barrel Brew. Please alert that they can change their products anytime, so the products lineup might not always the same. Death Wish coffee has an average of 728 milligrams of coffee per 12 oz. serving, which you can say that in every cup of Death Wish coffee has twice amount of caffeine compare to regular coffee. The company offer their customer money back guarantee if the coffee is not the strongest you have ever drink. This coffee is perfect for those who don’t feel their morning java is strong enough to make them feel awake. However the Death Wish may not suitable for all people, especially for those with heart disease and high blood pressure. If you are interested about other bold coffee, read our article on Cafe Bustelo vs Cafe La Llave here. To produce their coffee, Death Wish purchase different kind of coffee from various plant species, which is not disclosure by the company and it is understandable. However they say that they use coffee from various regions of Central America, Ethiopia and Indonesia. 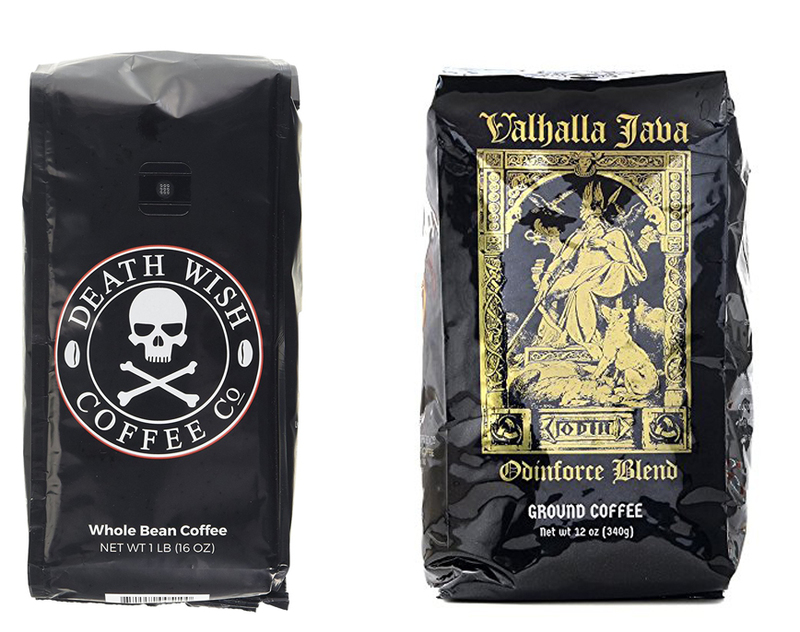 Valhalla Coffee or Valhalla Java Odinforce is a variant of whole or coffee ground by Death Wish coffee Company. Taken from deathwishcoffee, Valhalla Java Blendwas initially crafted for ZakkWylde. The coffee beans used to make this coffee are imported from Indonesia and other countries. Death Wish forged the Valhalla Java Blend from the volcanic soils of Indonesia and nutrient rich soil from Central and South America. Valhalla Java Blend uses both Arabica and Robusta beans from countries mentioned above. The notes of this coffee are chocolatey, nutty, sweet and has a smooth finish. Death wish has not stated about the caffeine content in this Valhalla Java Blend, but their statement remain the same with Death Wish is the strongest coffee in the world, so we may assume that even though this artisan coffee is strong enough, it still not as strong as the original Death Wish. Regarding taste and caffeine contain of Valhalla coffee, it may depends on the coffee variety and the roast level of each variants. For example the Sumatra coffee, which is bold, has herbaceous, spicy, wild, and mushroomy taste. This variant is full bodies with a light sweet acidity. Looking at their caffeine content, Death Wish seems to be able to hold its position as world’s strongest coffee. As all of us know, the deciding key is placed in everybody’s personal taste and preference. When choosing between Death Wish and Valhalla coffee, what we can take a conclusion is Valhalla Coffee is for those casual coffee drinkers who need more kick in their cup while for those who are not satisfied with their regular caffeine intake is recommend to opt for Death Wish.